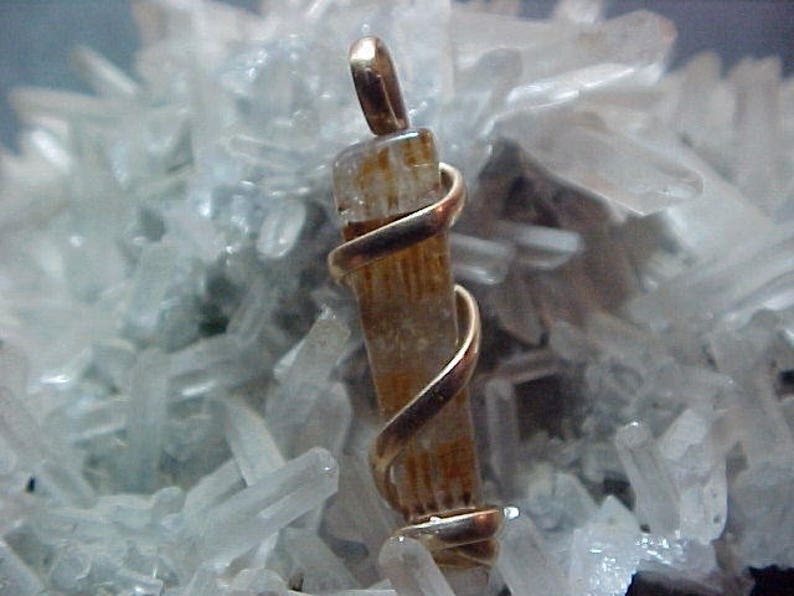 You are viewing this lovely, polished Agape Crystal Gold Filled Sacred Spiral pendant which measures 1x1/8" including the bail. Gracefully encircled with our Sacred Spiral design of Gold Fill, this Agape Crystal pendant will make a fine centerpiece for your creations, or add it to your collection of unique, natural stone jewelry. You will receive the exact pendant featured here, along with a purple keep-sake bag, a postcard size photo of our Agape Crystals being bathed in natural spring water, and a signed certificate, as our promise that you have purchased a genuine Agape Crystal pendant. AGAPE CRYSTALS (which contain the energies of Amethyst, Smokey and Clear Quartz, Rutile, Lepidocrocite, Cacoxenite and Goethite) never need clearing or cleansing and come only from Espirito Santo, Brazil. The name "agape" comes from the Greek word meaning "an out-pouring of unconditional love". After many years of working these crystals, we have also discovered some rare crystals that have exhibited 5 other minerals as well. Agape Crystals are associated with an out-pouring of the Divine Feminine energies such as unconditional love, compassion, forgiveness, and healing, to name a few. The "brotherhood" of minerals contained within these crystals is not unlike our brothers and sisters of our Native American Medicine Wheel, all sharing their energies and gifts with their human companions to help them on their paths to spiritual growth and completion. They are wonderful companion crystals for "reviewing and releasing" old ways of thinking and acting which do not serve us on our paths to enlightenment. They can also help us to create a new path to allow the ways of "peace and harmony" to rule in our lives, and help us to re-focus and manifest what is needed. In addition, these Agape Crystals can aid us in awakening, stimulating, and developing our psychic abilities, including telepathy, clairvoyance, clairaudience, claircognizance and clairsentience. It should be noted here that even if some of these minerals are microscopic and not eye-visible within the stone, all of their properties are still within the crystal, as they are all indigenous to the area where these crystals are mined. All of our Agape Crystals (and the jewelry made from them) have been bathed in the flowing waters of a beautiful, crystal-pure, spring-fed creek in our beloved Ouachita National Forest, near Mount Ida, AR. Agape Crystal vibrates to the master number 11, the most intuitive of all numbers, representing illumination and deep insight, as well as spiritual harmony. GOLD has been called The Master Healer and is a wonderful choice for those who seek to attract good health, wealth and happiness into their lives. It is also a good tool for those who wish to stabilize their emotions, calm anger and lessen the stress and tension from daily frustrations. Gold is the color of the Christ consciousness and can help to open, purify and balance the heart chakra. In addition, 14K Gold Fill has a percentage of Gold and also carries similar properties.